Casey is hiding again-in Memphis this time-but it's different now. She knows without a doubt that Dylan believes her and is doing all he can to help bring Brent's killer to justice. He's become an unexpected friend ... and even, maybe, something more. Hope makes everything more bearable. Casey makes a deal with the DA to turn over all the evidence she and Dylan have gathered against Keegan and Rollins-only to discover that the DA is in league with them too. After a desperate escape, who can they possibly turn to now? About "If I Live (#03 in If I Run Series)"
Customer Reviews For "If I Live (#03 in If I Run Series)"
This is the final book in the "If I Run" series. To understand this book, you need to have read the first two. This book was nail biting and full of suspense. Fast moving like the first two, but with a little more romance. I did breathe a sigh of relief and feel content with the ending. If you like suspense stories, you'll enjoy this series. If I Live is the final book in a trilogy, and don't even think about reading it if you haven't already read If I Run and If I'm Found. If I Live starts with a bang, as fugitive Casey narrowly escapes capture. The suspense never lets up, and there are plenty of unpredictable twists as Casey and Dylan work together to evade the police. The whole novel takes place over a matter of days. That adds to the pace. One of the potential dangers of reading suspense novels, especially a trilogy such as this, is that the focus is all on the suspense plot. It's all action-action-action with no character. The If I Run trilogy doesn't make that mistake. Casey and Dylan both grow as characters over the course of the series, and that focus on character lifts the series, and especially If I Live, out of the ordinary. If I Live is written in first person present tense from several points of view. I thought those choices added to the suspense, although I know some readers don't like first person andor present tense. Don't let it put you off. Recommended for thriller and suspense fans ... but only for those who read the first books first! What an awesome book series! The conclusion to the 'If I Run' series was fantastic and I enjoyed every word written in this book and storyline. I thought it would be hard to beat the first two books of the series but the 3rd book was definitely the best. What I found special about this book is that the story reads on for quite a bit after the 'bad guys' get captured. So we get to see what happens to Keegan, how he is processed  charged, how they go about finding out who is dirty in the police force AND we get see Casey's and Dylans love for each other grow into marriage. I really appreciated reading this as I felt it completely finished the story and didn't leave me wondering about all the characters and what happened to them. 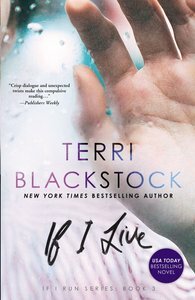 Thank you Terri Blackstock for such an entertaining, clean and suspenseful read. Totally should be made into a movie!